The Great Plains as they appeared about 1840 now lie outspread before us. 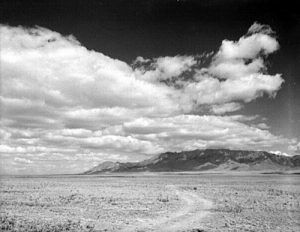 To the mass of American citizens living in the Eastern States that territory was then a forbidding desert never to be occupied by man. Only to the adventurers of the border, the hardy trappers, the traders traveling to Santa Fe, and those few army officers who had thus early penetrated the miles of prairie, were its great possibilities vaguely apparent. It was yet barren, desolate, and deserted save for its roaming Indian inhabitants. Much of it remained unknown except to wandering and illiterate hunters. The long stretch of the Missouri River had been navigated; parties of mountain men had made a passable trail up the valley of the Platte River; the traders’ caravans had gouged out a road to Santa Fe across prairie and desert; some shanties of logs, and a few stockaded forts, for purposes of Indian trading, were scattered here and there along the larger streams between the Missouri River and the Rocky Mountains, mere pinpricks in that wide expanse. In eastern Kansas and Nebraska a few hardy settlers were already beginning to establish habitations, but these, as yet, scarcely ventured to advance beyond sight of the Missouri River. In Texas there were settlements, made possible by a militant advance against Mexico; yet these exercised little if any direct influence over the destinies of the more northern Plains. The Government, because of the need of protecting the Santa Fe trade, had established a military post at Fort Leavenworth, Kansas but beyond this, and the above mentioned narrow roads of passage, the Great Plains remained an abode of savagery, yet to be conquered and reclaimed. Already those men and women to whom this gigantic task fell were turning their adventurous eyes westward. The contest may be said to have fairly begun with the first faint trickle of emigration toward the Pacific coast, and to have become stimulated into earnest activity by the results of the struggle with Mexico. The first turned the thoughts of the people toward the permanent settlement of the Northwest; the second brought to men generally a new conception of the possibilities of the Southwest. Thus was the curtain slightly lifted, and the period of exploration verged into that of the struggle for possession which prefaced permanent habitation. The beginnings of this new movement, although distinct, were slow and uncertain, yet in a comparatively brief space of time — as time is reckoned in a nation’s history — the first little wave had swollen into a torrent; the trapper, the trader, the soldier, the emigrant, each in turn, passed along the dim wilderness trails, leaving the blackened embers of camp-fires, the deep ruts of wheels, the ghastly relics of battle, yet ever making way for massing settlers behind, constantly broadening out the vista, and making known the truth. It is this period of Indian War and pioneer emigration that constitutes the second advance in the story of the Great Plains. To tell it rightly one must hark back slightly farther than the date set, for as early as 1834 travelers other than traders or trappers passed over the then barely traceable trail leading to distant Oregon. These pioneers of a great movement were missionaries, and they traveled in small separate parties from that year until 1839. The Lee brothers, Jason and Daniel, passed this way first. The following year Samuel Parker and Marcus Whitman traveled over the long trail. 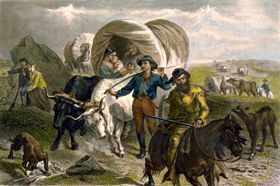 In 1836, Whitman, who had returned East, came back accompanied by his wife, Mr. and Mrs. Spalding, and W. G. Gray, it is said that at the trappers’ rendezvous on the Sweetwater these pioneer white women received a royal welcome at the hands of the gathered mountain men, and were escorted by them some distance on their journey. The remainder of the way they traveled under the armed protection of the American Fur Company. The 1838 party was composed of Mr. and Mrs. Walker, Mr. and Mrs. Eells, and Mr. and Mrs. Smith. In 1839 Mr. and Mrs. Griffin, with Mr. and Mrs. Munger, made the journey. These devoted missionaries labored long in the Oregon country, several of them yielding up their lives for the faith. Dr. Whitman, a few years later, made a heroic ride across the mountains and Plains in midwinter, suffering incredible hardships, to bear to Washington the news of the British encroachments on the American settlements on the Columbia River. To his self-sacrifice and patriotism the Northwest is greatly indebted. Not far behind these earliest forerunners of Protestantism came the Catholic devotee. This was P. J. de Smet, a Jesuit, who, under orders of his Superior, came to the upper Missouri in 1840 to minister to the Indian tribes, and whose life henceforth was devoted to their service. The early history of Catholic missions in the northern Rockies is little more than the record of this one devoted missionary. Father de Smet traveled extensively over the Plains and mountains, and wrote his experiences most interestingly. He was loved by the Indians and never molested, the visits of the ” Black Robe ” always being welcome in the wigwams. His principal labors were among the Salish tribe. It was in 1841 that the first band of settlers began crossing the Plains and mountains to Oregon and California. All who had passed that way before were but wanderers, with no settled purpose of peopling this new land. But these were settlers, men, women, children, and their slow passage westward marked decisively the beginning of a new era. They toiled slowly up the valley of the Platte, finding their only halting-place in all those thousands of miles the rude fur-trader’s fort on Laramie River. These were truly the pioneers, and they were so few, only fifteen; Joel P. Walker, wife, sister, three sons, and two daughters; Mr. Burrows, wife, and child; Mr. Warfield, wife, and child, and a man named Nichols. The loneliness, the terrors, the wonders of that journey to the women and children peering out from under the wagon covers as they moved on through those weary months, can scarcely be imagined. Close behind them toiled over the same dim trail Bidwell’s company bound for California; but at Fort Bridger this party turned more directly west following the route later made famous by the gold-hunters. A Mrs. Kelsey was the only woman in the Bidwell company. So in the same year the first emigrants passed over the long trails to both Oregon and California. From this date the stream constantly increased in volume. In 1842 a company of one hundred and twelve men, women, and children, under command of Elijah White, went through to the Columbia River. They had a train of eighteen great Pennsylvania wagons, with cattle, pack-mules, and horses. The next year an army passed that way, consisting of a thousand men, women, and children, bringing with them draft cattle, herds of cows and horses, farming implements, and household goods. This marked the beginning of the end of the old regime. Never again were things the same either on plains or amid the mountains. The period of permanent occupancy had begun.